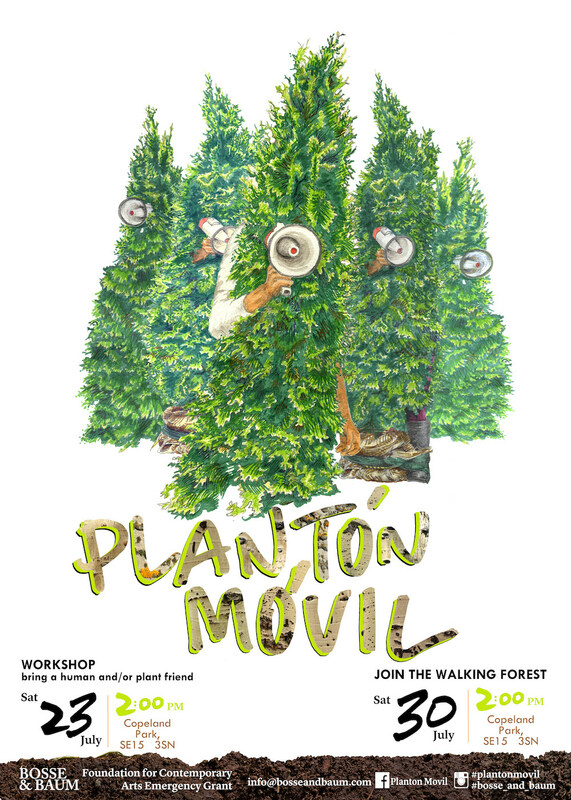 Bosse & Baum invite you to our workshop on Sat 23 July at 2pm in Copeland Park, SE15 3SN, in preparation for Planton Móvil taking place on Saturday 30 July. Please join us to create a transportation vessel for your plants (using bikes, bags, helmets, pushchairs, trolleys etc.) so you can bring them along to the walking forest for a peaceful protest on Saturday 30 July in Peckham. Bring a friend, a pet or a child and a transportation vessel (e.g. helmet, rucksack, baby carrier, backpack, pram, straps, belts, unwanted clothes). Plants will be provided but you are welcome to bring your own. During the workshop we will be building ways of carrying the plants so vessels are not entirely key, we’d like to expand and build a “network kind” of structure between people and plants during the workshop. Plantón Móvil is a project developed by the Peruvian artist Lucia Monge, it has occurred yearly since 2010 in different communities throughout Lima and was commissioned for the United Nations Climate Change Conference in 2014. Last year it made its international debut in Providence, Rhode Island, and this year in London. It will be the first of its kind in Europe, London and Peckham. In Peckham, an area which has undergone vast changes in recent years, this initiative will be a commentary on social movement and movement as a less perceptible form of inhuman mobility at large, an organic mobility that operates perhaps on different scales from people to plants. 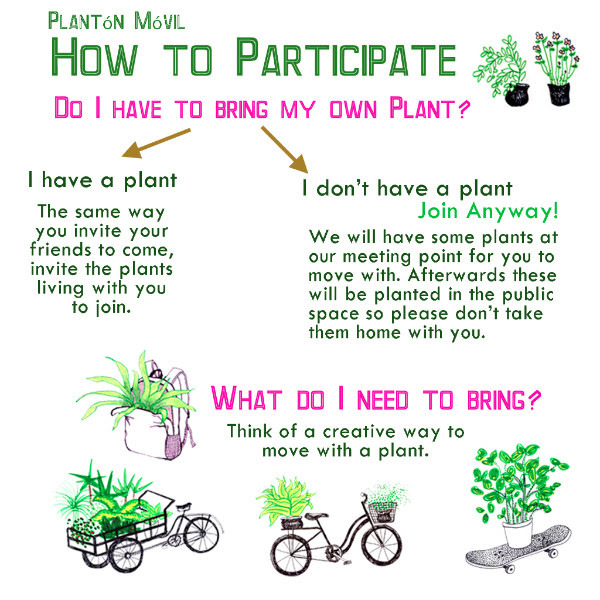 The workshop will be followed by a Plantón Móvil or plant walk on Saturday 30 July where the public are invited to parade through the streets of Peckham with their plants and transportation vessels. Plantón is the word in Spanish for a sapling. This project takes on both: the green to be planted and the peaceful protest. It is about giving the plants and trees the opportunity to walk down the streets of a city that is also theirs: like a small forest peacefully claiming its place and respect. People of all ages are invited to lend their mobility to these plants and in return, momentarily borrow some of their slowness.” At the end of each walk, the plants and trees will be planted in specially commissioned planters in Copeland Park, Peckham.